Tags: adam, angel, arches, architecture, art, attraction, catholic, ceiling, chapel, christian, christianity, church, create, creation, dark, display, europe, european, finger, fresco, gallery, genesis, God, hand, holy, human, illustration, indoor, interior, italia, italian, italy, masterpiece, men, michelangelo, museum, painting, plaster, pope, religion, roma, roman, rome, room, sistine, sistine chapel, tourist, treasure, vatican, windows. The Sistine Chapel ceiling is viewed through tilt shot footage. Many of Michelangelo’s frescos, including the Creation of Adam are seen. The shot tilts downwards towards the gathering of tourists enjoying the Chapel. Shot on May 5, 2012 in Rome, Italy. 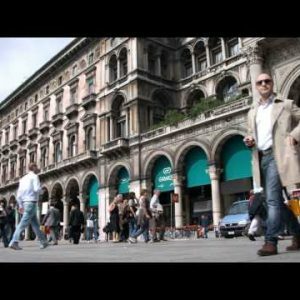 Royalty Free Stock Footage of People walking outside a mall in Milan Italy.